Durable, flexible, smooth, matt finish, weather resistant coating for exterior masonry. Albany Masonry paint is a smooth and durable water borne matt masonry coating. 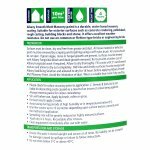 Suitable for exterior surfaces such as concrete rendering, brickwork, pebbledash, rough cast, building blocks and stone (except common fletton bricks). 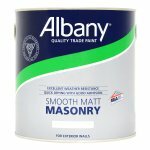 Albany Smooth Masonry has excellent adhesion qualities, good colour retention and resists flaking. 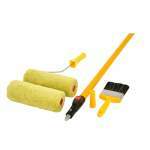 Apply by brush using a good quality masonry brush. When applying by roller a long pile woven sleeve is recommended. Can be airless sprayed (thinning with water is required). 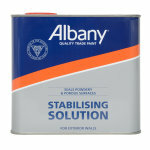 When using on a porous surface prime with Albany Stabilising Solution for best results. Water-based product which is touch dry in 2 hours and recoatable after 6 hours. 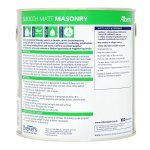 Albany Smooth Masonry Paint is a durable water borne matt masonry coating. Suitable for exterior surfaces such as concrete rendering, pebbledash rough cast, building blocks and stone. Do not use on common or fletton type brick or engineering bricks. Surfaces must be clean, dry and free from grease or dust. 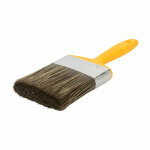 All loose material or defective paint must be removed by scraping and brushing using a stiff nylon brush. All cracks should be cut open. 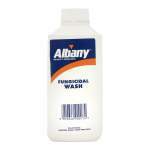 If green algae, moss or fungal growth are present, surfaces must be treated with Albany Fungicidal Wash. Remove dead growth, re-treat with a further coat of Albany Fungicidal Wash if required. Allow to dry thoroughly. Fill cracks with a 3:1 sand/cement mixture and allow to dry out completely. Old lime and chalky surfaces must be treated with Albany Stabilising Solution and allowed to dry for 16 hours before applying Albany Smooth Masonry Paint. Avoid the inhalation of dust. Wear a suitable face mask if dry sanding. For best results a minimum of 2 coats are recommended. One litre covers up to 10 sq metres, depending upon surface texture, porosity and the method of application. On highly textured surfaces the spreading rate may be greatly reduced.